Isn't this owl cute? His eyes were the perfect size for some googlie eyes too. I did all the coloring with my Copic Markers. I added some Burgundy Shimmmerz to the balloons, then covered them with Crystal Effects. They really stand out, but also shine under the glaze. The blue sky I did with the chisel end of my BG10 Copic. Paper: Bali Breeze Designer Paper, Old Olive, Neenah White, Rose Red. Other: Button Bouquet, Rhinestone Brads, Crafter's Tool Kit, Crystal Effects, Circle Punch, Label One Nesties, Shimmerz, Sakura Glitter Pen, Google Eyes, Poly Twill Ribbon, Scor-pal. Hi everyone! I can't believe it's Friday.. this week went by SO fast. We've been sick again... well, not really sick, but plagued by constant coughing. Almost everyone is on antibiotics now, so I hope over the weekend, we'll all get some peace and finally kick this cough! Here's the sketch! I hope you can find some time this weekend to play! 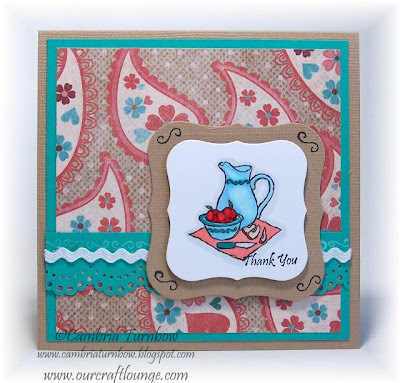 I had a Stampin'Up! card that I worked on yesterday, but didn't finish it up, so I'll have to show it another time. I've go the twins to get in to the Dr. today, and other errands so I need to keep it short. Sorry about that.... 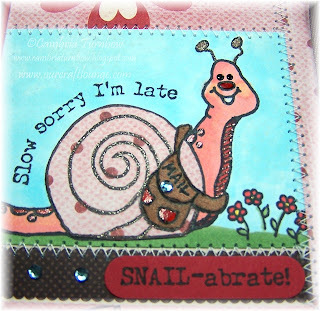 I really do try to use a variety of stamps and not just OCL on my personal blog. I've got some Lizzie Anne and Hanna half put together too... so if you can hang with me, I'll get it together. 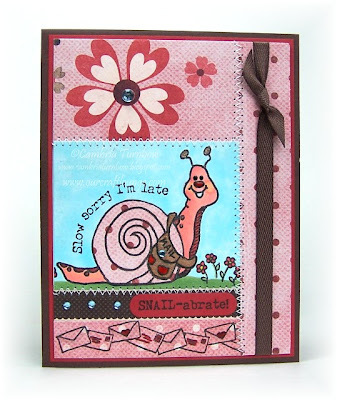 If only there were more stampin' hours in the day right? This is that same paper that I bought for Valentine's Day. It's from My Mind's Eye and it's called Irresistible. The buttons are from Basic Grey... all the colors match perfectly. I paper pieced the hat. 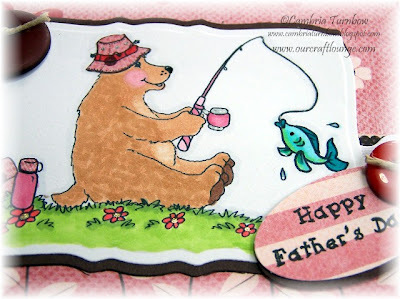 Made the bear a girl since my daughter is the only one who really LOVES to give people cards. She is so excited to give this one to her Daddy. The fish and water drops are raised up and shiny thanks to my Sakura Clear Glaze pen. Paper: My Mind's Eye, Neenah White, Chocolate Chip, Riding Hood Red. Other: Nesties, Cuttlebug, Jody's Foam Dots, Large Oval Punch (SU! ), Basic Grey Buttons, Natural Hemp (SU! 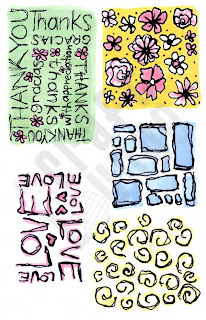 ), Sakura Glaze Pens, atyou Spica Pens, Bazzill Cardstock Border Strips, Scor-Pal. Sheldon and I are both on antibiotics, and I take the twins in today. Having a cough for over a month is not normal. I think I'm on the way to feeling better and already coughing less, but Sheldon is home again today sick. What a bad flu/cold season this year! I hope you are all staying healthy. See you tomorrow for the weekend sketch! Lori did this one and it's AWESOME! Thanks for stopping by! 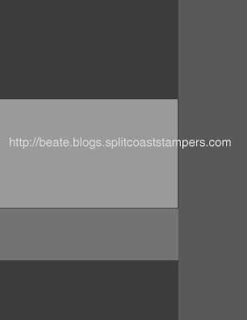 Today, I read about Jenn and Beate picking the colors for the color challenge over at SCS. Of course, it didn't surprise me that they were Earth Element colors. I am totally Earth Element challenged and Beate just rocks the EE's. I did have some Kiwi Kiss... and some pretty designer paper with pumpkin in it. I did not have any Summer Sun. No problem right? Pink is good... you can always use pink. I also got to play today for awhile at my friend Nancy's house. 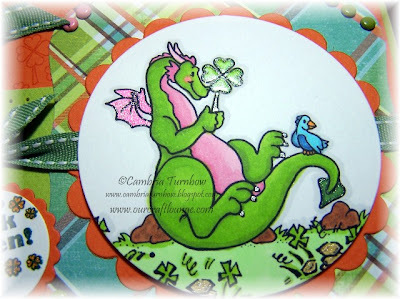 I took over the St. Patrick day sets and when I got to her house, she had the Dragon out..... we looked at each other, like a light bulb went off in both our heads! Just wait until you see what Nancy did... she's amazing! 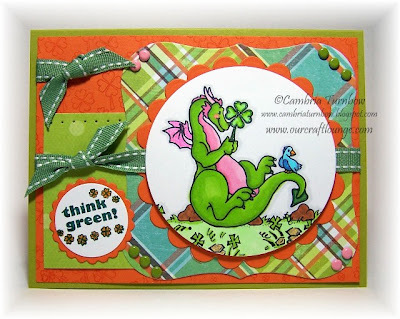 Stamps: Drake the Dragon, Irish Blessings, Kiss Me, I'm Green. Paper: My Mind's Eye (Just Dreamy2), Kiwi Kiss, Pumpkin Pie, Neenah White. Ink: Ranger Distress Soot Black, Copic Markers, Pumpkin Pie. Other: atyou Spica Pens, Sakura Glaze Pen, Crafter's Tool Kit, Circle Nesties, Cuttlebug, Scor-pal, Wasabi Ribbon (SU! ), Brads, Jody's Foam Dots. I never did make it to the grocery store! I know, I know... but I have an excuse. My poor soon was SO sick this morning when he woke up.... it's been way too long with a cough. He wanted to go back to school at lunchtime... he's so worried about missing more school work and time from school. So, I got him into Dr. right after school, and of course the clinic is PACKED with sick kids so our wait was not short.. same with the pharmacy. So, I am going to make it tomorrow... for sure this time. Really.... I am. Morning Stampers! Boy is it windy and rainy on the OR Coast. It stormed all night! I hope the rain lets up a little today.... I put off going to the grocery store again. I must go today! My friend Kisa, is a brilliant! 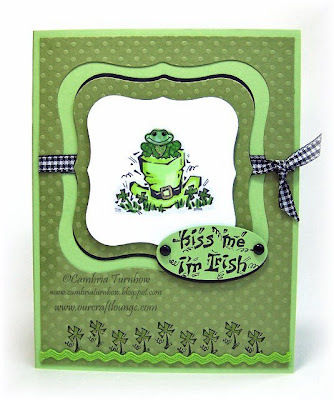 She made a super cute card using the frog from the Bubs The Beaver stamp set. You can see it here. Isn't that cute? Brilliant huh? So... she is my inspiration. 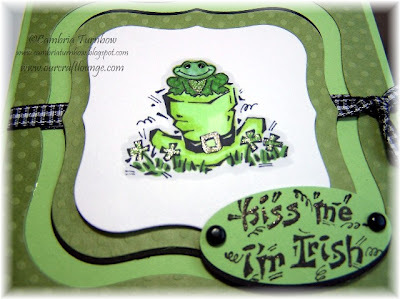 I used the same cute frog on top of the Irish hat. The frog is spotted. One of my favorite things you can do with Copics.. just go back over him with a lighter green and make your spots! Paper: Dotted Green (Bazzill), Apple Crush (Bazzill), Neenah White, Basic Black. Ink: Ranger Distress Black, Copic Markers. Other: atyou Spica Pens, Sakura Glaze Pens, Jody's Foam Dots, Labels One Nesties, Cuttlebug, Large Oval Punch (SU! ), Vintage Brads, Black Gingham Ribbon, Ric Rac (Walmart), Sco-pal. I'm off to brave the weather, to feed my family! Dramatic huh? LOL. Have a great day! Thanks for stopping by! Good morning Stampers! Hope you had a great weekend. I had some stampin' playtime this weekend and I can't put down this set! I LOVE the Just Bugz! I'm still using that designer paper from My Mind's Eye that I misplaced and then found AFTER Valentine's Day. I discovered a new product at CHA. Well, not new, but new to me... I found out while doing Make and Takes that a lot of Scrapbook stores use this product. It's called Zip Dry Paper Glue. I know, I know... where have I been? I love it! It dries fast, but gives you enough wiggle time. If you get outside the edges... like if it smooshes out, let it dry, then simply rub it off. I've already gone through one bottle, although it lasted a long time! Do you use it? 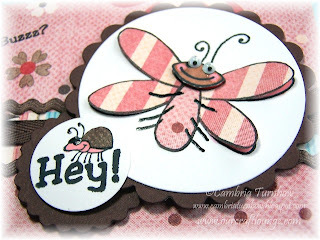 I stamped the cute little bug on the cardstock, then colored him in. Then, I stamped him again onto the designer paper and cut out his wings and body. On the wings, I applied a tiny layer of Zip Dry on the inside part (closest to the bugz body), then let it dry. When dry, I lifted each wing and added a foam dot under it. His head I stamped again on Neenah White, cut out, colored, then added a foam dot under it too. I thought this little guy was screaming for some googlie eyes! Paper: Irresistable, My Mind's Eye, Neenah White, Med. Baby Blue Prism, Chocolate Chip (SU!). Other: Sakura Glaze Pens, Sakura Glitter Pen, Jody's Foam Dots, Nesties, Cuttlebug, Chocolate Poly Twill Ribbon (SU! ), White Gingham Ribbon (turned chocolate with my Copic Marker), Blue Brads, Crafter's Tool Kit, Circle Punch, Scor-Pal. A quickie today! I wanted to try one more with Beate's Weekend Sketch. I had the scrap pieces out, so I threw it together. 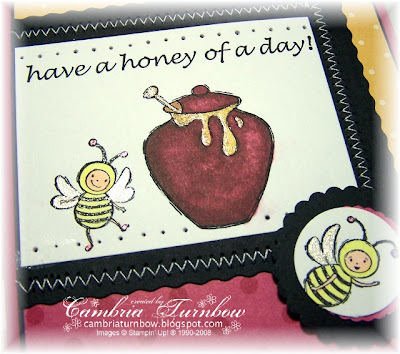 I used paper from the Palette' O'Prints pack from Stampin' Up! along with the set called Buzzin' By. The fun part is all the extras I added to make it shine and stand out. I used the new atyou Spica Pens to add some honey sparkle to the honey, then added Clear Sakura Glaze over the top so that is really looks like oozing honey. Of course I added extra glitter to the bees wings and their antennas too. 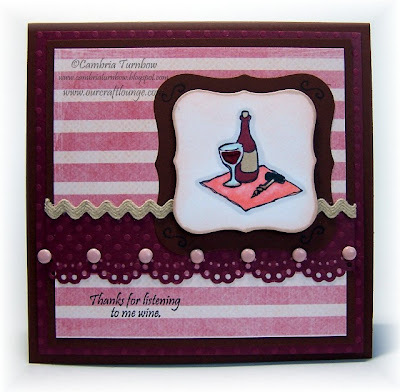 Paper: Neenah White, Basic Black, Palette O'Prints Designer Paper, Rose Red. Other: Martha Steward Scallop Circle Punch, Circle Punch (SU! ), Purple Cow Cutter with Wavy Blade, Crafter's Tool Kit, Soft Subtle Brads, Dimensionals, Janome Sew Mini, Scor-Pal. Hope you had a great weekend... they always go by too fast don't they? Thanks for stopping by! Life is sweet huh? Even without cupcakes, it's sweet indeed. Hello Sweet THANG... say it. Isn't it fun... SWEET THANG. 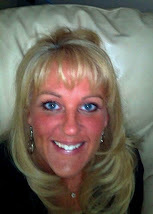 LOL.. okay, okay, I know, I am heading to get my coffee and start my day... get all the goofy off. Today the twins have a basketball game, so I do need to get my buns moving. Hope you have a fun, SWEET Saturday! Paper: My Mind's Eye (Just Dreamy2), Neenah White, Chocolate Chip, Taken with Teal, Bazzill Cardstock Strips. Other: Oval Nesties, Cuttlebug, Jody's Foam Dots, Sakura Glaze Pens, atyou Spica Pens, White Satin Ribbon (American Crafts), Scor-Pal. Good morning Stampers! 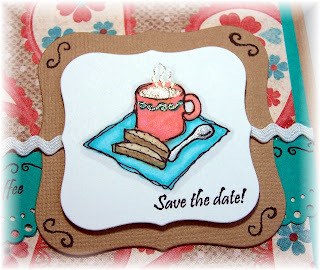 This morning I played with some images that I stamped at my last get together with my girls. I'm also on that mission to use of scrap pieces of designer paper. 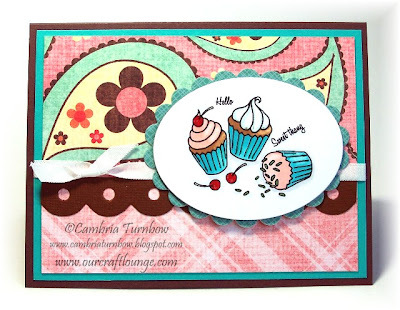 This set is called Sweet Stems from Stampin' Up! The paper I believe is the retired Bali Breeze Designer paper. 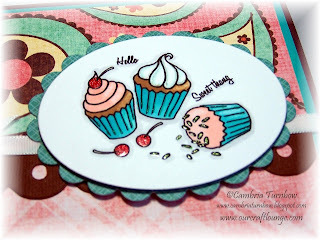 Stamps: Sweet Stems, Short & Sweet. Paper: Riding Hood Red, Neenah White, Barely Banana, Bali Breeze Designer Paper. Ink: Memento Black, Copic Markers. Other:Small Oval Punch, Circle Nesties, Cuttlebug, Sakura Glitter Pen, Dimensionals, Riding Hood Red Ribbon, Banana Grosgrain, Banana Brads, Crafter's Tool Kit, Janome Sew Mini, Scor-pal. I can't believe tomorrow is Friday already! I'm working on my sketch card today... you are going to like this one! Beate does the best sketches! Have a great Thursday! Thanks for stopping by! Ha... love that.... "Who's Your Doggie?" makes me smile every time. I remembered that I forgot to share with you the Valentine's I made for my kids. I remembered that I forgot... lol, that is too familiar these days! Do you remember Nicole's boxes I made for Averie's Valentine's? I had all these pieces left over of scrap paper. Dang it if I can just throw them away... I'm the worst at hoarding and not throwing away scraps when it comes to designer paper. I know my desk would look SO much better if I just tossed it. Just.... can't... do it. So, I took the pieces of scraps left over from the boxes and made these for my kiddos. 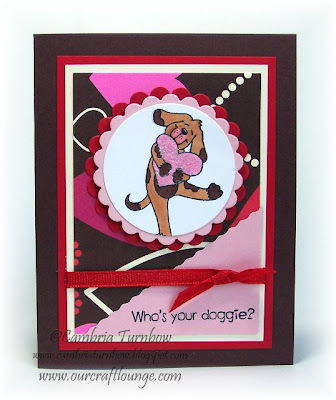 No matter how much they see me stamping and making cards, they never seem to tire of getting one hand made by me. Gotta love em! Even my 15 yr. old smiled and touched the heart. The hearts all had Fluff on them... a new product we'll have soon at OCL. Averie's had the Sparkly Fluff since her heart was pink. All I have in the Sparkly is the pink... go figure. I know I'll get some other colors soon though. *wink*. 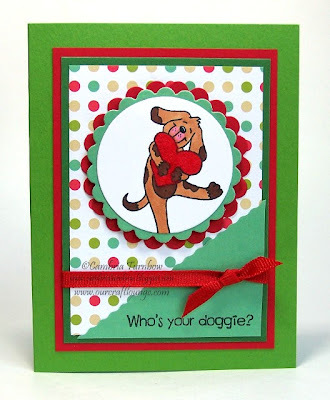 Paper: Americn Crafts Designer Paper, Real Red, Neenah White, Chocolate Chip, Unknown Green. 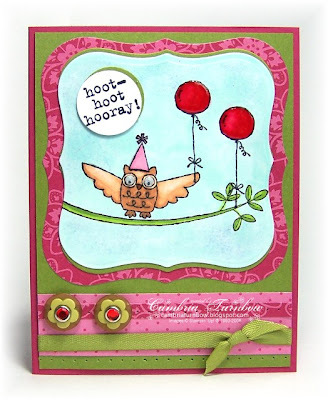 Other: Circle Scallop Nesties, Cuttlebug, Red Grosgrain Ribbon, Jody's Foam Dots, Scor-Pal, Fluff, Sparkly Fluff. Good morning stampers! Yesterday the kids were home, but I still found some time to stamp! I really need to use up the piles of scraps I have all over my desk. Do you do that? I have THE hardest time every throwing away designer paper, no matter how small the piece. So, you can all see how busy we've been lately with the new release. This is the part of being in this new venture that I struggle with. It seems like I don't have enough time to be creative and actually play too much with our stamp sets. Lucky for us, we have some very awesome friends who help us out each month making amazing samples. I must admit though, it makes me a tad jealous at times. I used some paper that I bought for Valentine's Day, then lost on my desk! I found it... but of course AFTER Valentine's day. Lucky for me, it still works and I love the colors. All of the images, have a little extra shazam added with atyou Spica Pens and Sakura Clear Glaze Pens. I LOVE those pens. they dry fast and people just have to touch your cards! Here's a close up... you'll have to click on the photo. Paper: My Mind's Eye, Prism, Bazzill (Fawn), Neenah White. Ink: Ranger Soot Black, Copic Markers, Craft White. Other: Nesties, Cuttlebug, Ric Rac, Dimensionals, atyou Spica, Sakura Glaze Pens, Martha Steward Punch, Crafter's Tool Kit, Scor-pal. I'm working on more cards today, but taking a break to take my husband to lunch! I'm looking forward to it. :) Have a great day everyone! Thanks for stopping by! 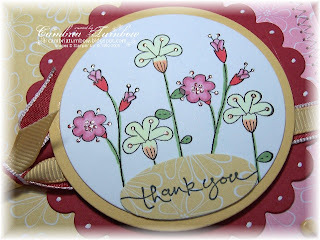 Thanks for the chance to win...enjoyed looking at everyone's creations...and the great new stamp sets. 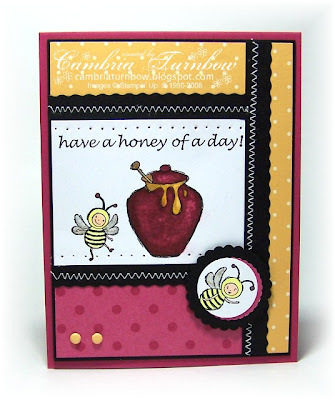 Congratulations LindaH... please email me at cambria@ourcraftlounge.com and we'll get your new set in the mail! Thanks for playing everyone!! Good morning stampers! Wow, thanks so much for the fun weekend! I loved hearing which were your favorites. This set is one of mine.... I love flower sets and can never have too many. I do love this style... I thought it was very unusual. At least, I do not own anything like it... until now. 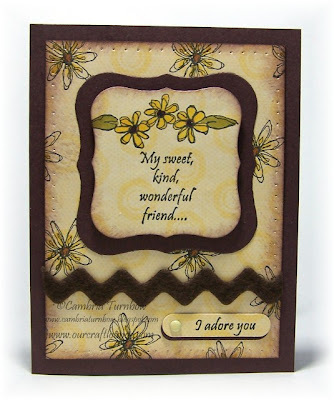 Of course you can't see all the pretty glitter in the centers of the flowers, but it really does add to the card. 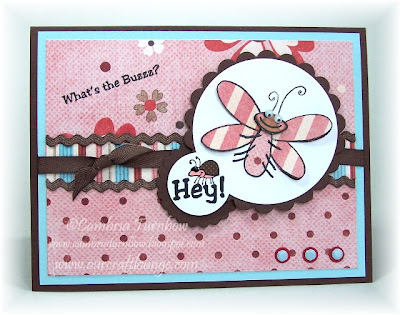 The background is white, but cuttlebug'd on top two panels, then the bottom one is plain, but I stamped with the border stamp that comes in the set. Here is another... really simple one. The designer paper is from My Mind's Eye (Just Dreamy 2). I stamped directly on the paper, sponged along the edges, added some color with Copic Markers. The centers of the flowers on the main image have glitter on them too. Paper: Neenah White, Basic Black, Rose Red. Other: Cuttlebug, Cuttlebug Embossing Folder, Marvy Square and Circle Scallop Punches, White Ribbon (American Crafts), Vintage Brads, Scor-pal. 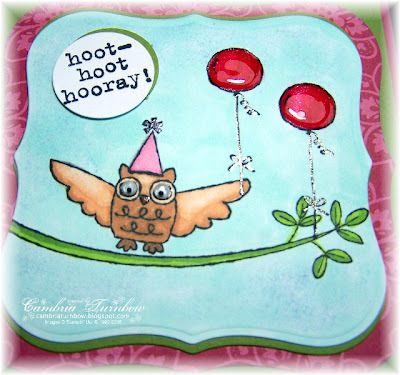 Other: Nesties, Cuttlebug, Crafter's Tool Kit, atyou Spica Pens, Word Window Punch, Heidi Swapp Brads, Felt Ric Rac (American Crafts), Scor-pal. 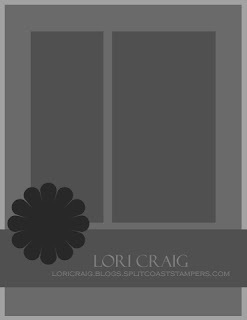 So, it's not too late to win the Whispy Patterns background set. I'll be back later today to draw a winner (on the previous post). This concludes our Blog Candy Times 28 Give Away! Thank you for such a wonderful release! I love so many of the new sets, but I have to say my very favorite is the Botz Family. They're way too cute! All three are A-Dorable! I have to say, though, that my fav of those three is Wispy Patterns. So fabulous! Okay V.... you win Shower The Baby! 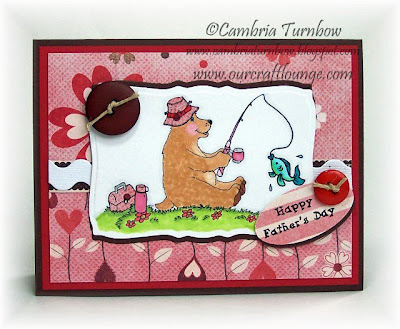 email me at cambria@ourcraftlounge.com and we'll get that set out to you! You still have a chance to win Whispy Patterns! Thanks for playing everyone!! Happy Valentine's Day! Yesterday was fun! Thanks to everyone who played along and a BIG thank you to all my little blog candy helpers! Can you believe how talented everyone is? Blows me away when I see their creations! I could not have done it without you girls... thanks SO much! There is still time to win! Yesterday, I gave away Granny's Support Team and All the Children of the World. See THIS post for your chance to win the remaining sets. Starting today, on this post, you can leave me comment about which was your favorite sample posted yesterday... or any other comment you'd like to leave. I was just blown away at the samples from the girls... I'd love to hear which was your favorite. The winner will receive one of my favorite sets called Whispy Patterns. You can see that it matches with many of our sets this release. 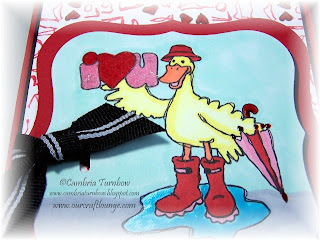 I used it on this sample and look how well it matches Ducky Days! Other: Nesties, Cuttlebug, SU! 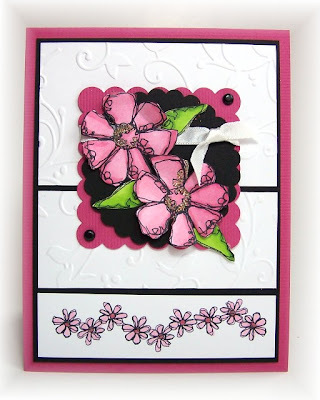 Black Ribbon, Sakura Glaze Pens, Sparkly Fluff, Fluff, Quickie Glue Pen, atyou Spica Pens, Slot Punch, Scor-Pal. Hope you have a great weekend. I finished up all Averie's Valentine boxes just in time to make it to her party at school. She was so happy to hand them out.... makes every minute working on them worth it. :) Later today, the twins have two basketball games. I need to slip in a trip to the store too... so I better get my buns moving! I love Friday's - the restaurant. :) Okay the day is a good one too. Thanks for the chance to win. Congratulations Rachelle! 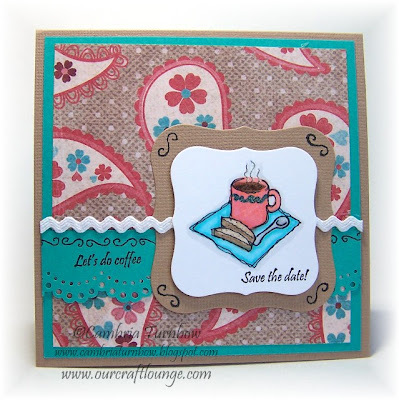 Send me an email at cambria@ourcraftlounge.com and Granny will be on the way to visit! Thanks for playing! I'll see you tomorrow for another chance to win!